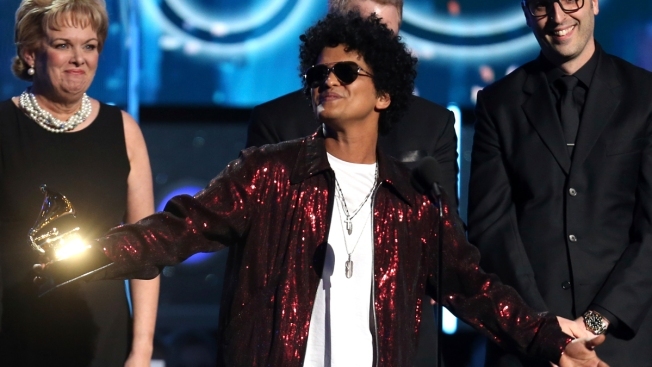 Bruno Mars accepts the award for record of the year for "24K Magic" at the 60th annual Grammy Awards at Madison Square Garden on Sunday, Jan. 28, 2018, in New York. The Weeknd, Bruno Mars, Jack White and Arctic Monkeys will headline this year’s Lollapalooza music festival in Chicago. Travis Scott, The National, Vampire Weekend and Odesza also were among the performers announced Wednesday morning on Lollapalooza’s website . More than 180 acts will play on eight stages Aug. 2-5 in Chicago’s lakefront Grant Park. Founder Perry Farrell launched Lollapalooza as a touring festival in 1991. It’s been held in Chicago since 2005. The lineup includes LL Cool J, St. Vincent, Logic, Khalid, Walk the Moon, Dua Lipa and Perry Farrell’s Kind Heaven, which will feature guest musicians performing songs from the Jane’s Addiction singer’s upcoming solo album. Last year’s festival drew 100,000 people a day over four days. Organizers say it had a $245 million local economic impact in 2017.